I watched Gitanjali Rao’s Printed Rainbow (2006), in India when it was just released in Cannes, winning Best Short Film Award in Critics Week. It was a stunning discovery of a film and an artist. The film is not merely a masterpiece in painted image, propelling an entirely new aesthetic and bright new parameters for animation. Besides its immensely meaningful skills in story-telling, the film was an exercise in cinematic themes; from the permeability of screens in our lives that would blend reality and representation to integral qualities of sound design in a narrative. Its invocation of the match-boxes for transposition of the past and the present, of life and death, was admirable. Printed Rainbow made me ever-so-eager to see her next work. Her short, Chai, part of the online anthology project, India-is, reinforced the impression that Rao was capable of framing complex issues in simple yet eloquently rich frames, while remaining sensitive to humane aspects of social life. It is a short story not merely about Chai, the potion that runs through the veins of India’s social life, but a piercing tale about displacement, homelessness and social justice. Then comes her 19 minute short film, True Love Story, now making its LA Premiere on April 10 at the International Film Festival of Los Angeles. It is a rewarding visual experience at the minimum, and a treatise on both cultural critique and social sensitivity of a filmmaker at its best. This is her signature painted animation, rendered meticulously expressive by the intricate skills of the artist to reach into the minor nooks of the image to portray emotions in depth. Rao juxtaposes the contrast between the fantasy life of Bollywood films and the realistic conditions of some of its biggest customers, those who live on the streets. Bollywood’s larger than life image is already harsh, loud and excessive. The colors and edges of the figures lack the delicacy or the tenderness of breathing life. The image of the man and the woman on the street, him a flower-boy selling to the customers in traffic and her, a mother preparing gajra on the pavement while she attends to her ailing father and a child. Rao’s choice of primary colors, set in careful contrasts among the characters, the street-dwellers and passers-by alike, intensifies the passion of her life in Bombay. Here, the figures are tender and graceful, caught in a whirlwind of motion and movement around them. Some of the minute expressions on the faces of the protagonists are a joy to behold. When Rao takes the scene to a dance club, the nourish look encases a set of glamorous dancers on the stage, flickering light transposes the image from intense color to translucence. The spectrum of her images, richer in its nuance than any Bollywood spectacle, leaves the two worlds of glamor and reality richly laid out for a meaningful narrative. Salim and Kamla fall in love. Their major idiom of love and relationships, of villains and victories is provided by Bollywood. Soon, they both realize that unseen parts of their lives are breathing underneath their everyday romantic selves. The conflicts of their lives are far more realistic than those on the screen. The displacement that placed them in their social positions, on the street and fending for survival by any means, is far more aggravating and real than the artificial crisis of the dream factory of the city. Rao paints the clash between the two in simple terms. But each frame speaks of the conditions in social dimensions. If this was just a love story gone awry its script was already written by Bollywood. Rao’s touch on the desperate lives of the people who live on the streets adds richness to what may be just a pleasant achievement of watching beautiful animation. This is a Bombay-ite’s film as it is a film by critic of Bollywood. That the two inhabit the same space with such skills foretells optimism of her cinema as well as those who support her. Filmed in visuals that are cinematic, with different planes of action active in the same frame, True Love Story is at Bollywood’s door steps. In its distinct image and familiar narrative the film straddles the two worlds while also remains a special achievement. The image and the narrative tell only a partial story of the film. Its prominent asset is its intelligent, multilayered sound design. This speech-or-dialogue-less film, employs a variety of sounds (the rain, the rushed traffic in the city, the whirling helicopter, the wedding band on the streets, local rains the footsteps and the dance steps—to name but a few) is made richer by Rao’s sound designers P. M. Satheesh and Manoj M. Goswami. They have created decorous yet intricate and complex yet accessible architecture for this film. Additional Sound comes from the Laya Project, to Hindi film songs from Gulzar, Indiyar, the poetry of Faiz Ahmed Faiz (in Noor Jehan’s voice), while on another level, it is layered by everything from rap songs in the car of the goon to the filmi songs that have become soundtrack of city life in India. And, to weave all this so smartly in the film, sound mixing ought to take a bow its work. It is difficult to be an animation artists in the age of Disney. Disney’s tentacles have long spread in India and financing projects that have original creative voices is quite hard. 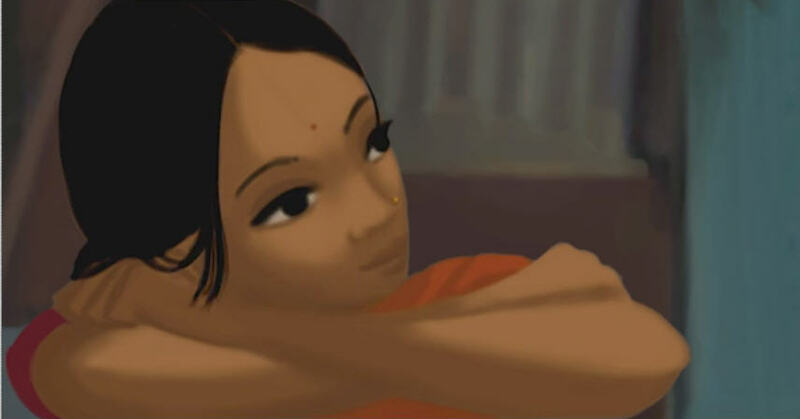 It is a shame that Bollywood’s commercial engine makes outcasts of quality animation artists such as Gitanjali Rao. Her worldwide success and recognition tells the story of the support she needs, the sorry state of similar productions and in equal measure the poor spectatorship of independent animation films in India. Thank you for this wonderful write up! Makes it worth all the while to make a film that you observe so so carefully! Overwhelmed!